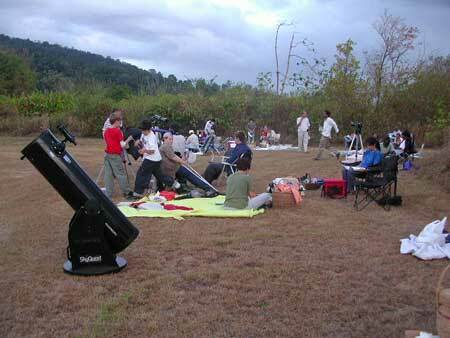 A Star Party is, in effect, a big night-time picnic. People spread out in groups of family and friends on the grass and spend the evening together, looking skyward, picking out planets, constellations and principal stars. Those with observing equipment such as telescopes and binoculars can see much more, but a strong love of the night sky is the basic requirement. April 25th has been chosen for several reasons. Firstly, there will be no moon (New Moon) on April 25th, so the glare caused by the moon will not interfere with viewing the fianter objects in the sky. Also, it’s a good time of the year to see the so-called winter constellations, Taurus, Orion, Gemini and so on, which fill the western sky after sunset, while allowing for the summer Milky Way to be overhead later in the night. Also, Mercury is visible right after sunset while Saturn remains high in the sky for most of the night. Finally, it’s dry season and the chances of a clear sky are good but without the haze that prevails later in the season. 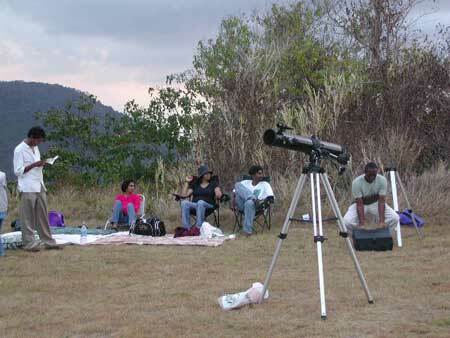 The old U.S. Tracking Station at Macqueripe in Chaguaramas is a spectacular location for a Star Party. It’s high up on a hill with breathtaking views in almost all directions, yet it’s flat and grassy which makes it ideal for a “picnic”. The old Radio Dish makes a stunning backdrop to a night of Astronomy. If you haven’t seen it before or it’s been a long time, try to arrive early so that you can take in the sunset in this wonderful setting. After dark, you won’t be able to see much of it. The access road is on the right hand side of the Macqueripe road, about two hundred yards from the Guard Booth at the entrance to the beach. For those of you unfamiliar with the area, the junction is after Pier 1 in Chaguaramas; turn right just after the bridge. Macqueripe is right at the end of the road, four or five miles along. There will be CARINA personnel and security guards at the entrance to the access road. Show your tickets, get logged in and drive up. It takes about five minute to get to the top. When you reach the top of the hill, you’ll have to make a left hand turn to drive the final few yards to the car park. This should be clearly indicated. 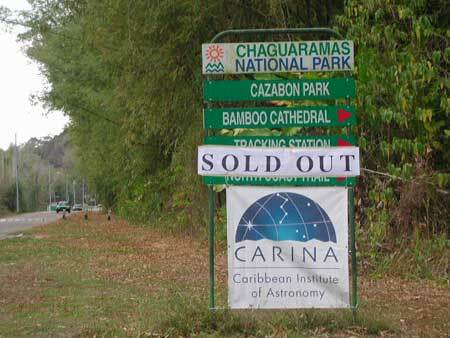 At the top there will be CARINA personnel with torches who will direct you to a parking spot. If you are arriving after 7:00 p.m., please turn off your headlights as you reach the top. The observing area is to the West of the parking area. It’s a large, open grassy field bordered by a scrub hedge. Feel free to choose an area to settle down. If it’s dark, CARINA personnel can guide you to one. If you are using a flashlight, please keep it shielded as much as possible. Hopefully there will be just enough light to see your way around once your eyes have become accustomed to the dark. You should bring a large blanket or rug to spread out on. Beach chairs are good too. Ideally, you’ll be spending a lot of time looking upward so you’ll want to find a comfortable way to do this (Standing does not work for long!). Lying down with a pillow beneath your head is probably the best way of all. If you plan on staying until morning, a tent is a good idea, but not essential. It's a rare opportunity to overnight in a beautiful spot in complete safety and we hope many people do so. Pack a cooler with drinks and bring along food just like on a regular picnic. Don’t plan on any Barbeques or campfires though! Please bring along a garbage bag and take your trash with you when you leave. It may get quite chilly and a little breezy so you should wear warm clothes. We don’t anticipate any problems with insects but if you are especially sensitive to them you may want to cover up or to bring some spray. There will be portable toilets on site, on the Northern side midway between the car park and the observing area. There will be low lights to guide the way. CARINA organizers and CDA security personnel will be around at all times. We will be wearing glowsticks so that we can be easily located. There will also be a tent on site where handouts and help are available. You don’t need a telescope to enjoy this event (of course, it helps!). Even a good pair of binoculars permits the discovery of many interesting objects not visible to the naked eye. A star map is important and CARINA will have copies of these available for everyone. To use it, however, you’ll need a torch. Regular torches are not good for this purpose because they are too bright and because the white light destroys your night vision (and that of the group next to you…). You should get a small torch and tape some red plastic film over the front. Test it before you come. It takes only a small amount of light to read the star map and the red light protects night vision. If you're bringing a camera, please be careful with the flashes. If you have a telescope, then you should make sure it’s working properly before the 12th. You may also wish to get to the site early enough to set up properly before sunset. For those who require polar alignment, Polaris is easily visible from the site. People with binoculars and telescopes may be interested in locating a series of interesting (and in some case challenging) celestial objects. CARINA will provide handouts with a list of these objects and their locations. By checking off the objects as you find them, a log of the evening’s viewing can be created. From 7:00 p.m. to 9:45 p.m., CARINA will host a Star Theatre. This will comprise a series of presentations on a large screen. Bring a cushion and make yourself comfortable on the grass. The presentation topics are listed on the Star Party flyer. The location for this will be to the North of the parking area close to the Radio Dish so that the light does not disturb people in the observing area. These presentations should be of interest to all with a love for, but no deep knowledge of Astronomy. Of particular importance will be the first presentation, an introduction to the night sky, which will give everyone a quick orientation of the Earth in space and point out the principal objects and constellations overhead. This will help you get set for the evening. When you are ready to leave, please spare a thought for others and try to do so without shining too much light around. Also, please ensure that you have left no trash on the site. Finally, please try to leave the carpark on park lights only until your car is facing away from the observing area. While we can plan for most things, some are just, plain uncontrollable. In the event that the sky is completely clouded over for most of the evening or, worse yet, there is a heavy downpour and everything becomes drenched, we’ll have no option but to bring the evening to a premature close. However, if this does happen, we will schedule another evening before the end of April and everyone can reuse their tickets then. The exact date will depend on site availability and the phase of the moon, but we will stick to a Saturday. CARINA wants the Star Party to become an annual outing that people look forward to and that they use to deepen their familiarity and love of the night sky. We look forward to ideas, comments and any feedback that allow us to improve this event year by year. We invite you send these thoughts to us along with your own personal experiences on the night. It would also be great to receive photographs from anyone courageous enough to attempt photography through the eyepiece! All feedback (and your pics) will be posted on this site.